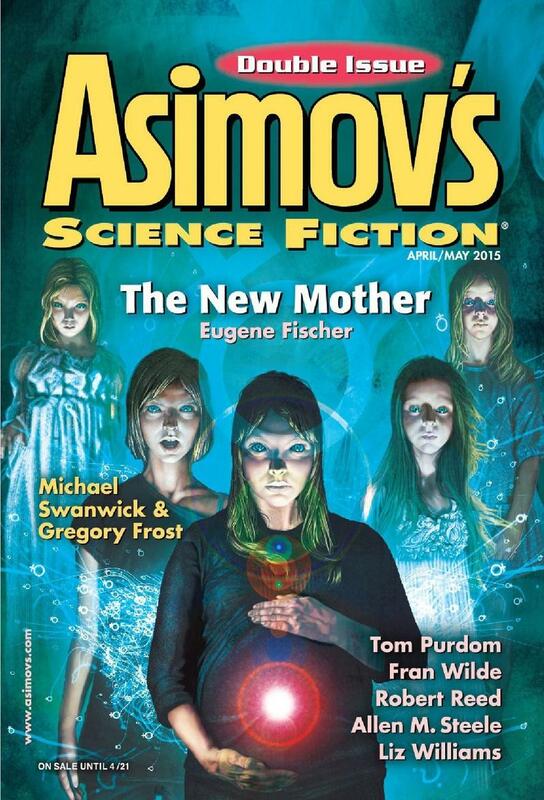 "The New Mother," by Eugene Fischer [bio] (edited by Sheila Williams), appeared in Asimov's Science Fiction issue 04-05|15, published on February 23, 2015 by Penny Publications. Pro: The concept is fascinating, and the author does a good job of showing how the threat of such a disease would cause splits in the usual conservative/liberal blocs. Tess's worries about her own child add tension that steadily builds toward the end. Con: The story is heavily larded with infodumps that really make it drag. Most of the material introduced in the story never gets used again. For example, there's an interminable scene between Tess and her mother where we learn a lot about Tess's family, but to no apparent purpose. The ending is inconclusive. Tess is convinced the baby is her clone because they appear to have similar anxiety issues, but that's hardly conclusive.